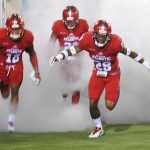 BOCA RATON – Surprised that FAU didn’t hand the ball to Devin Singletary and Buddy Howell more frequently during the Owls’ season-opening loss to Navy? So was coach Lane Kiffin. Along with trolling his former boss – Kiffin, who came to FAU after three years as Alabama’s offensive coordinator, has previously criticized the manner which Saban delivered critiques to his coaches – Kiffin also sent a message to his current offensive coordinator, Kendal Briles. Frequently during the spring and in fall camp Kiffin complimented the FAU running back unit as being the Owls’ best group. He also noted that Baylor’s offense, Briles’ previous stop, was one of the better rushing teams in the nation last season. Yet during the first half of the Owls’ season-opening 42-19 loss to Navy, FAU handed the ball to Devin Singletary three times and Kerrith Whyte only once. Buddy Howell, the 1A to Singletary’s 1, didn’t get a touch in the first 30 minutes. “As you study (Navy), it is a throw-to-beat defense,” said Kiffin, noting that teams like South Florida and Louisiana Tech effectively moved the ball through the air last season. With Navy loaded up to stop the run, the Owls elected to stretch the defense with horizontal passes. That didn’t work well. Six of FAU’s 21 completions either went for no gain or lost yardage. While many of those play calls came from the sideline, quarterbacks Daniel Parr and De’Andre Johnson did have the opportunity to check out of plays. 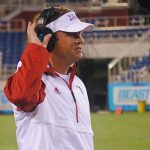 Kiffin believes FAU’s relative youth at quarterback – Parr made only his second career start, Johnson has yet to start a Division I game – led to Navy’s decision to eliminate FAU’s ability to run the ball. Incumbent starting quarterback Jason Driskel didn’t play in the game. If that was Navy’s strategy, it was effective. Penalties, poor snaps and ineffective execution led to three of FAU’s first four drives actually losing yardage. FAU managed only two drives of more than six plays, both of which resulted in field goals. Singletary finished the game with 26 yards rushing on six carries. On the stat sheet he finished behind Kerrith Whyte (six carries, 36 yards) and Johnson (four carries, 31 yards). Howell only carried the ball once, gaining eight yards. “We’re not productive on offense,” Kiffin said. Coach Kiffin said in a comment that if it happens in practice it will happen in the game. During the numerous camp practices open to us season ticket holders and alumni, we all saw the same receivers dropping passes and running the wrong routes(not counting the new WR that probably doesn’t know where his classes are since he arrived only 2 weeks ago) that did the exact same thing in the Navy game. We all saw Nate Terry catch long passes and cause mismatch problems with his 6’7″ Plaxico Burress type frame in these same practices attended and recorded by the coaches, yet he was on the sideline all except one offensive play. We have all seen for 3 years how Buddy Howell wore down defenses including our own FAU defense in practice and the awesome(and productive) thunder and lightining combo he and Devin Singletary put together last year, but he was also on the sideline. If it happens in practice it will happen in the game right coach? So why not use your own philosophy. I get it, SPEED KILLS! What good is speed if they can’t consistently catch or know the play calls and signals? This isn’t track, it’s football. A receiver needs to be able to receive. He needs to be able to read defenses so that he and the QB are on the same page. Even I knew the signal given by Parr and all I’ve seen are a few FAU practices. And please stop some receivers faking an injury when they drop a pass or run the wrong route. It’s embarrassing! Those guys know who they are and did the same thing in the practices to get away from the scolding the coaches should have given them. Again, speed is necessary Coach Briles in your spread offense, but so are hands and a football IQ.